Today we present a deliciously easy-to-prepare White Tuna cake. 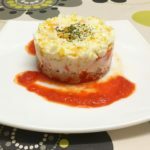 Ana (Recetas para cocinillas) combines the ingredients layer by layer to create a timbale full of flavor and color. A yummy starter in the shape of a cake; easy and beautiful. Take note of the recipe! Mix the piquillo peppers in a blender-friendly glass, until obtaining a thick, lump-free creamy mixture. Add the milk and stir with a whisk until both ingredients are well mixed and the sauce is lightened. Boil the egg for 10 minutes in a saucepan with boiling water and a pinch of salt. Place two tablespoons of pepper sauce on the plate to be used for serving. Drain the White Tuna and place a round layer, using a plating ring. Add a tablespoon and a half of mayonnaise. It will act as a binding agent for the cake. Place a layer of surimi sticks’ pieces on top of the mayonnaise. Peel the boiled egg and grate it with a fine grater. 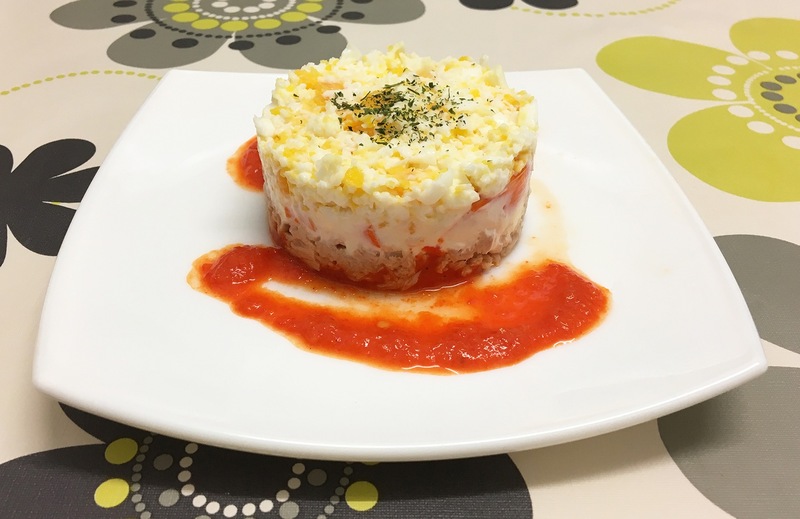 Place a layer of grated egg on top of the surimi. Sprinkle some chopped parsley on top. Delicious, easy and pretty. Thanks Ana! If you like this recipe, you can make it at home with the White Tuna available in our online store.